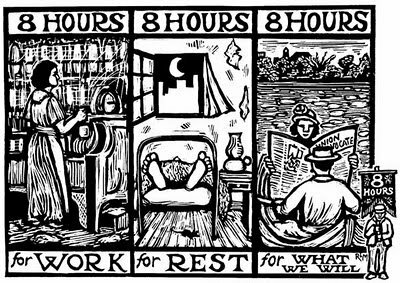 On May 1, 1886, 800,000 workers from all trades and factories throughout the United States went on strike. They were protesting child labor and trying to gain support for an eight hour workday. ​ On Sunday, May 2, factory workers, lumbermen, brick-makers, freight-handlers and iron-workers participated peacefully in the strike. There were many parades and many of the leaders of the workers made speeches. Some of the speeches were radical and sparked a great deal of emotion with a lot of people. Some of the strikers felt that a peaceful strike was useless. They favored aggressive and violent protests. Some were even considered anarchists. The majority of workers however, were peaceful men, striking simply to improve the quality of life for their families. Many strikers tried to negotiate with their bosses and come to an arrangement both sides could be happy with, but most of the bosses refused to give in to any of the striker's demands. On May 3, the next day, about 12,000 strikers gathered at the McCormick Reaper Works on Western Avenue, Chicago. The strikers armed with stones shattered the windows of the factory. The police arrived but the mob refused to break up. Instead, they started throwing stones at the police officers. The policemen fired twice over the heads of the rioters and then fired directly at the rioters killing four and injuring many others. Officer Mathias J. Deagan was one of the policemen killed at Haymarket Square. ​A protest rally was called for the following day on May 4, 1886 at Haymarket Square. Angry protested vented their anger to each other. Men gave militant speeches about political corruption and worker mistreatment. When the police came to break up the meeting, a bomb was thrown into the crowd. Seven police officers were killed and many others were seriously injured by the blast. The police responded with gunfire. More people were killed and over 100 people were injured in the Haymarket Square Riot. ​On Wednesday May 5, 1886 there was anger and confusion in Chicago. No one was able to identify the person who threw the bomb. Chicago police gathered up labor leaders, searched houses, without warrants, and closed down union newspaper offices. Hundreds of leaders of the labor movement were hauled into jail for questioning, not just in Chicago, but throughout the country. Martial Law was declared across the nation. The grand jury indicted 31 suspected labor radicals for playing a part in the Chicago bombing. Eventually, eight men were convicted in a controversial trial following the Haymarket Riot. The men were convicted without any real evidence against them. These eight men were: August Spies, Albert Parsons, Louis Lingg, Adolph Fischer, George Engel, Oscar Neebe, Samuel Fielden and Michael Schwab. ​The trial of the Haymarket anarchists was heavily criticized because of the lack of evidence against the men. Their lawyers earned themselves a bad reputation for not properly defending them. Seven years later, in June 1893, Governor John P. Altgeld pardoned the three men who were still living and serving prison sentences. He condemned the entire judicial system that had allowed the injustice. Click on the Haymarket Riot Trial below to go to an Interactive Website about the Haymarket Riot.